I designed this hat using some of my favorite stitches. If you see me out in public, I’m likely wearing a hat. I LOVE hats! 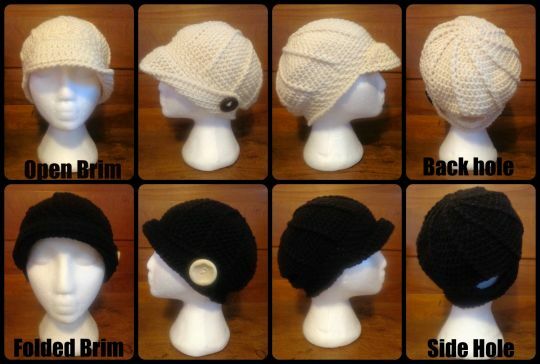 This hat uses front posts, crossover stitches and crab stitch. On one side, it has a folded wing, with a big ole button, on the other side, it’s a brim hat, and from the front, it looks a little “flapper”-ish. It also has a ponytail hole in the back, or you can put the hole on the side (It’s an 80s thing I guess LOL). I like this hat because it speaks to my own personality….A little indecisive…a little off the beaten path….when you can’t decide which style or stitch you like best….you just put them all into one. HA!